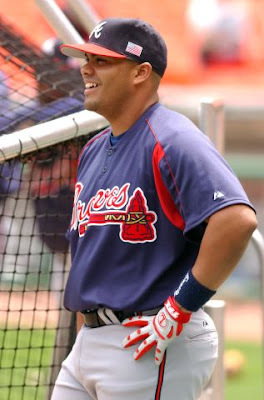 It looks as if Brayan Pena is a shoe in to be the backup catcher for the Atlanta Braves this season. He won't be in a platoon with Brian McCann the best catcher in the National League but he will probably catch Kyle Davies starts and get a bunch of starts against lefties to get McCann occasional breaks. Pena assigned to Davies? Brayan Pena is catching and batting fifth today vs. the Dodgers, probably a pretty good indication he’ll be assigned to catch Kyle Davies’ starts this season. Bobby Cox indicated during pitching camp last month that he’d go back to using his backup catcher for a specific pitcher, the way he did most seasons until last year, when he started out the season with Brian McCann and veteran Todd Pratt in a platoon. Pena doesn't hit for much power and he doesn't steal bases but he is an excellent contact hitter. He draws a decent number of walks and doesn't strikeout. He isn't someone you want to build around but I think he'll make a good $1 endgame catcher in NL-only leagues.